November | 2016 | Mothers Against Wind Turbines Inc.
All together now let’s raise a glass of cheer and send them all packing! The Harm the wind industry has inflicted fails to generate any sympathy over their current wails of woes. Niagara Wind came online in October 2016 and already MOECC is being called out to measure noise emissions and multiple complaints demanding investigation, representing a new wave of families and individuals who are finding their health adversely impacted by wind turbines. Yet project operators and industry continue to turn a deaf ear, heckle and belittle impacted residents and no meaningful action taken to relieve suffering of wind power’s making. Turbines continued to be allowed to kill wildlife and fragment sensitive environmental habitats with the protections of legislated government statutes. Yet its is expected the ratepayers paying for this sorry state of affairs are expected to be worried about the wind industry’s economic well- being? Sorry no go. If wind power wants to survive as a viable renewable and be “sustainable” it is beyond time to clean up the mess and deal with the realities of your spinning Industrial turbine generators. St. Catharines/Niagara, Ontario – Local business leaders Tom Rankin and Ken Williams called on the Ontario government (this November 16th_ to protect local jobs by ensuring that renewable energy remains a vital part of Ontario’s Long-Term Energy Plan. Rankin, CEO of Rankin Construction on Martindale Road, and Williams, President of Pumpcrete on Progress Street, will be representing the newly formed Renewable Energy Alliance of Ontario (REAO) at Ministry of Energy led consultations tonight at the Holiday Inn on Ontario Street in St. Catharines. Together, Rankin Construction and Pumpcrete employ over 700 hundred people in the St. Catharines and Niagara Falls region. Rising power bills — not just lack of good jobs and high food prices — are forcing hundreds of thousands of Ontarians to turn to food banks, a new report by a food bank umbrella group warns. In yet another sign of the crisis caused for many in the province by soaring electricity rates, the Ontario Association of Food Banks says the fallout is putting the squeeze on the basic needs of many. Mayor Higgins of North Frontenac has petitioned in Ontario court to be an intervenor in the Judicial Review (JR) application filed by CCSAGE Naturally Green (over the approval granted for the White Pines project in Prince Edward County). Green Energy Act removes Municipal government’s authorities over the placement and operations of renewable energy projects. Renewable Energy projects and installation of wind turbines have devastated rural communities in a manner that urban areas are not subject to. “The JR has the potential to help protect all rural Ontario from the continued onslaught of these industrial machines. If you are an organization, coalition or individual anywhere in Ontario who has suffered as a result of actual or threatened installation of turbine projects, you may be able to assist in one of two ways. One, by applying to the Court for status as an Intervenor for which a lawyer is required for those incorporated, and, two, by providing us with an affidavit containing information not otherwise already dealt with”. Terrified, Carol and her husband do all they can to remain strong for their family. Wealth is not only measured in money but what resources you can access to create a safe home for your family and children. Electricity is an essential service in a cold climate country like Canada. Rates in Ontario are out of control and an increasing number of homes are now in default and cannot pay their bills. Without electricity furnaces don’t heat, food isn’t kept safe for consumption in cooled refrigerators, water pumps don’t bring water to a home, sump pumps in basements sit idle allowing water to seep in resulting in mold and structural damage. What has fuelled the crisis of today? The tipping point has its roots in the Green Energy Act of 2009 which included the institution of a cryptic entity called the Global Adjustment. This mechanism is used for recovering differences in costs such as introducing renewables generation systems and the priority access to the grid given for wind and solar. It includes the cost of the contracts held with renewable generators which are paying above market rates for electricity, selling electricity at a loss for out- of- sync demand generation and a growing frequency of payments for curtailment. Consequences for political decisions made surrounding energy policies are personal. Having your electricity cut off for non- payment is a nightmare but it is also a measure our society. How do we protect the vulnerable and what will be done? Cancelling wind contracts would save billions in costs and would be for the greater good. Ontario’s energy policy is generating anger and attracting media attention as rates spiral out of control and residents face the heart wrenching dilemma of whether to heat or eat. Energy poverty that the Premier acknowledges is her government’s mistake but fails to take action to correct. A good place to start is to cancel wind power generation contracts and stop construction of any wind project not yet built. It is never too late to do the right thing. “Aside from the repeated, incessant warnings — there was no warning. Ontario’s energy costs have spiraled out of control. Consumers are struggling to pay their hydro bills and still have enough money left to buy a ticket to one of the premier’s cash-for-access fundraisers. 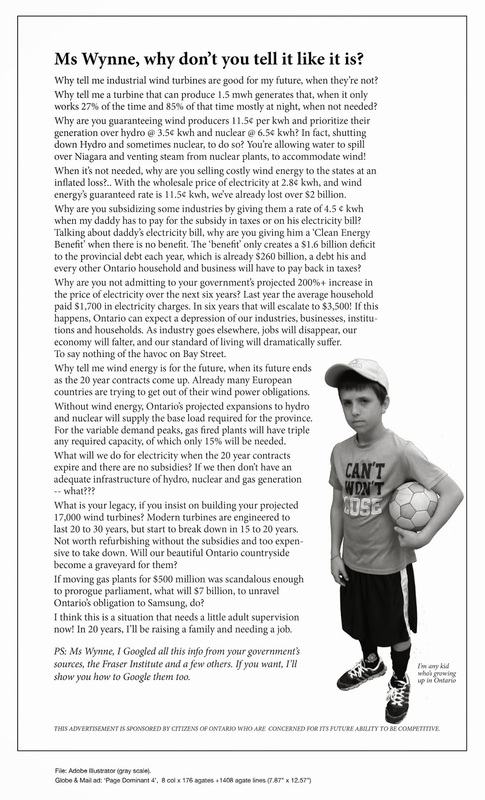 Who — with the exception of everyone — could have foreseen that wasting billions of dollars on cancelled gas plants, paying way above market value for green energy contracts, producing too much energy and selling it to other jurisdictions at a loss, and investing in smart meters that didn’t actually do what they were supposed to do would translate into skyrocketing electricity bills for everyday Ontarians? Why didn’t someone — besides the auditor general, both opposition parties and various economic experts — say something? Now Ontario finds itself in a mess of its own making, locked in unsustainable contracts and a looming cap-and-trade scheme that will make hydro bills even more expensive, all while some Ontario families have “had to choose between paying the electricity bill and buying food or paying rent,” according to Premier Kathleen Wynne. Thanks, guys. “Our government made a mistake. It was my mistake. And I’m going to do my best to fix it,” Wynne admitted in a rare moment of contrition during her address to her party’s annual general meeting this past weekend. Huron County Health Unit is hosting an information session about the Wind Turbine Investigation. Please attend & RSVP. Residents of Huron County are invited to an information session hosted by the Huron County Health Unit. The session is about the upcoming investigation related to reported human health concerns associated with residential proximity to industrial wind turbines. There will be information on the investigation survey, and time for residents’ questions. Please let us know if you plan to attend at 519.482.3416 (Dial 0 to speak to receptionist). November 21, 2016 turbine 126 suffered a catastrophic structural collapse as documented in photos shared on Facebook. Ocotillo Wind Energy consists of 112- 2.37 MW Siemens wind turbines. The project was built on California public lands by Pattern Energy and began commercial operations in 2013. It is now 3 years and the project continues to demonstrate ongoing structural and operational issues for this ill conceived facility. On November 21, 2016, one of the turbines at the Ocotillo Wind facility fell within the designated setback zone surrounding the turbine’s base. No one was injured in the incident. We are working closely with the turbine manufacturer, Siemens, to identify the root cause of the failure and a full investigation is currently underway. Relevant authorities have also been notified. Our first priority is the safety of our employees, contractors, neighbors and the environment. We are taking this issue very seriously and will communicate more information as it becomes available. Pattern Energy is proud to be part of the Imperial Valley. Our Ocotillo Wind facility is an investment in the region that is creating many economic benefits, including jobs and substantial growth in the property tax base. The facility supports local initiatives through the Ocotillo Wind Community Benefits Program, which established the Ocotillo Wind Community Fund, Ocotillo Wind Education Fund and Ocotillo Wind Imperial Valley Fund, and is administered by the Imperial Valley Community Foundation. Sign up here to receive updates about the community benefits program and facility news. The work of cartoonist Adrian Raeside illustrates some of the cumulative harmful impacts from human activities to migrating avian species that use the global flyways. Habitat loss, avoidance and mortalities are direct adverse impacts arising from the installation of wind power generating facilities. Killing the natural world one spin at a time.